Please follow the process below to configure your machine to participate in the Locustream project and create an open mic. 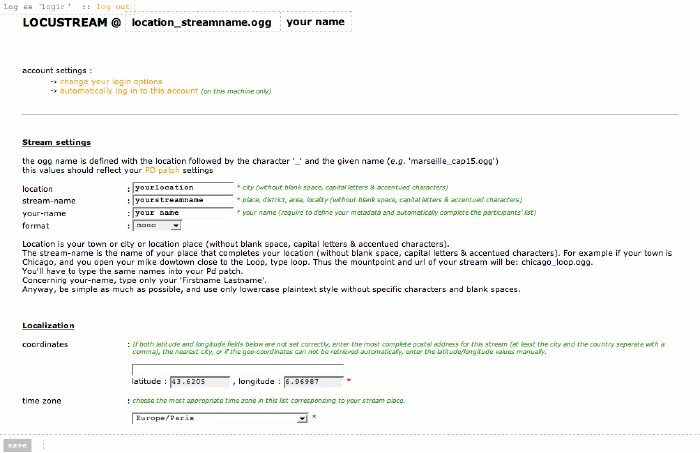 copy and paste your STREAM-NAME created by the database system (its form will be : city_location.ogg) : you find it on the top of your account page. click on "Locustream soundmap" and check on the map if all is ok .
You currently have the option of selecting a PureData patch (Windows, OSX, Linux) or a standalone OSX application for streaming (Locus Streamer). We have created a animated map which shows the location of all the streams worldwide. Those currently active have a orange colored icon. By clicking on a location, one can listen to the audio stream in a browser. 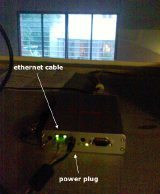 We have developed a "streambox" - a mini-PC equipped with a microphone and configured to connect to our streaming server as soon as it is plugged in. These boxes are equipped with a wireless and ethernet connection, they use very little electricity, and run silently (it doesn't need a fan to cool itself). It has a sound card, video out, 2USB and a network card. So yes, it's like plug and play for the streams. We are currently (Fall '09) beta testing the streambox, a first version was available : first prototype (3C3, 0.5). And we're currently working on the current version (3D3, 1.0). See below 2c.2 how to receive a LocuStreamBox. Streamers may request a Streambox for a nominal fee of for free for research & experimentation purposes, in order to ensure the permanent functioning of the webmics. We currently finalize a prototype 3D3 v.1.0 with an updated firmware (BIOS), and preview next versions. It's still in development but the prototype is working well. We send freely a streambox if you're ok to be a test expert with us, so for this participation to the technical development we request that your stream is always up along next months. 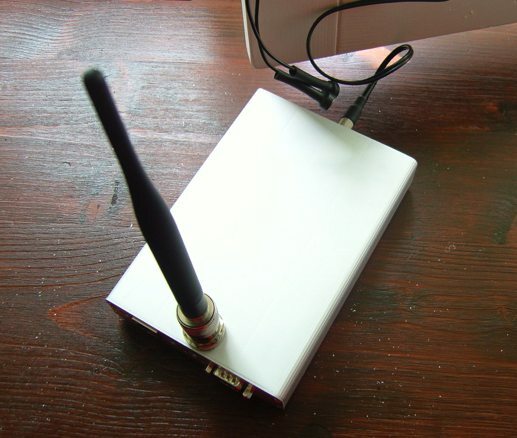 Thus we can test continuous audio streams with the streambox prototype and improve our sound installations & on-line interfaces connected to the open microphones network. The streamboxes are currently freely distributed and delivered as a prototype we can test and experiment with the community of voluntary streamers. The results of this collective (art) work offer an efficient development, in one hand, of the technical process and virtual audio network, and in a second hand, of the researches and studies based on art forms with audio flux. So depending on the availbility of the components, we build and distribute series of streamboxes. 20 streamboxes have been currently delivered (sept. 2009). 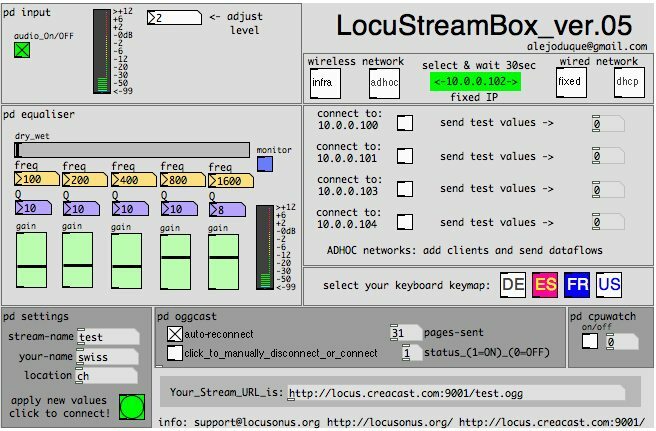 In order to receive a streambox, please contact support (at) locusonus.org . For information, the cost of a streambox is being finalized, but will be around 160/170 euros (plus shipping). we're currently building a LocusMic (visit the information page). It's a very small electret microphone with all the components into the sleeve of the jack. The microphone is a slightly higher quality omni electret made by Panasonic (MCE-4000). You can use a (series of) audio extension cable (jack 3.5mm). The electret is powered by the streambox (circa 5V). 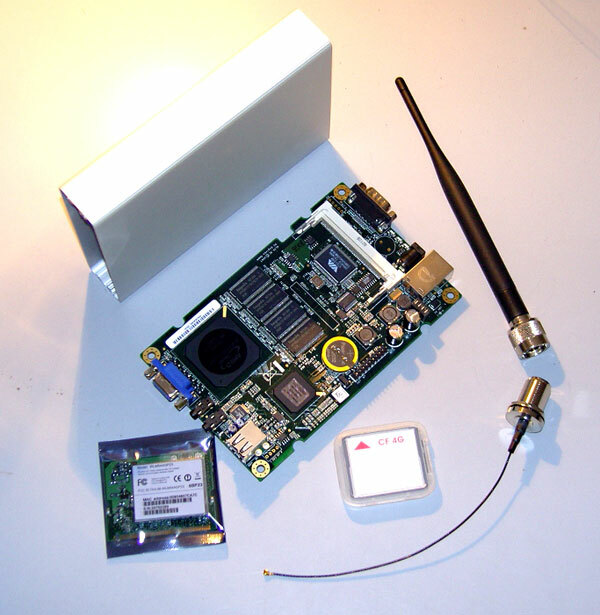 The LocusMic is sent with LocuStreamBox bundle. or you can use your own (electret) microphone or your own sound configuration. Different types of mic can be used : electret, piezo, etc. It depends on the nature of the sound capture you want to stream. In order to improve or to customize your sound captation, you can use acoustic filters and focusers, such as a parabola, a windshield, a windscreen, etc. Have a look at the webmics examples (this page is still in progress). The Audio Tardis is continuously available online (on the front page of locusonus.org or directly at http://locusonus.org/tardis/). It is a listening sequencer and soundscape-saver, automatically navigating amongst the live webmics. The Locustream project generates continuous studies and listening experiments (like the Carpophores project by Esther Salmona and Journal de Bord by Nicolas Bralet - see more info -, and other studies by researchers in sociology and architecture). We are glad if you would send us feedback about your own experience and reflections. Thanks to Hans-Christof Steiner for Pd-extended maintenance, to Olaf Matthes for Pd & Max/MSP ~ogg objects, to GOTO10 for Pure:Dyne distrib and to the very helpful supports provided by the users & developers communities. Thanks to Stéphane Cousot for PHP/mySQL programmings and Gilles Misslin (Creacast) for streaming server maintenance and bandwith. Post-grad research group : École Supérieure d'Art d'Aix-en-Provence (School of Arts), École Nationale Supérieure d'Art de Nice Villa Arson (School of Arts), in association with CNRS/MMSH/LAMES Lab Univ. de Provence (Samuel Bordreuil, Sociology Research Lab). Research Directors : Jérôme Joy, Peter Sinclair. Administrative coordination : Anne Roquigny. 2007/2009 Locus Sonus Lab: Julien Clauss, Alejo Duque, Scott Fitzgerald, Jérôme Joy, Peter Sinclair. 2005/2007 Locus Sonus Lab: Nicolas Bralet, Sabrina Issa, Jérôme Joy, Nicolas Maigret, Esther Salmona, Peter Sinclair, Lydwine Van der Hulst. Fellows: Brett Ian Balogh (SAIC), Stéphane Cousot (Ind. ), Clémentine Maillol (CNRS), Jean-Louis Paquelin (ENSA Nice Villa Arson). Scientific Council 2006/2007 : Samuel Bordreuil, Philippe Franck, Bastien Gallet, Christophe Kihm, Bernard Stiegler, Raphael De Vivo, Michel Waiswisz. 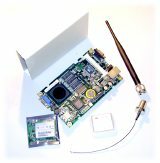 Webmaster : Locus Sonus lab.